Ecofeminists, particularly in the work of Yvonne Gebara, have called Christians to think about the connections between poverty, violence (to Earth and humans), and immigration. When examined from the reality of the U.S./Mexico border the ecological damage/violence, which has been a reality of the maquiladora industry since the 1970s, has now escalated. It is estimated that over 400 maquiladora workers have been killed in Juárez. This presentation will examine the theological and ethical challenges made by ecofeminists and how these can be used to issue a call for justice for the women on the border. Please join us at Perkins School of Theology, Prothro Great Hall, at 6:30pm at SMU in Dallas, Texas. For more informationand/or a selected reading from Dr. Machado, please contact Professor Jayson Sae-Saue at jsaesaue@smu.edu. This is the last event for the “Migration Matters” series at SMU, and the one I am most excited about. Dr. Evelyn Parker is a mentor to me, and Dr. Daisy Machado will be amazing, I am sure. I will report back on this next Monday. The situation for women working in maquiladoras and for women and children migrating across the border needs serious attention. I look forward to the insights and inspiration this night will bring. 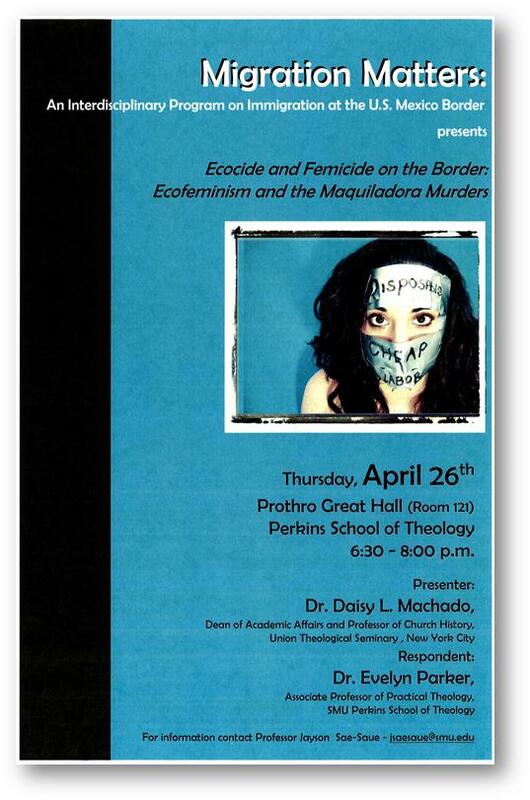 The Reverend Dr. Daisy Machado (Union Theological Seminary, New York) spoke about the connection between conceptions of nature and women’s bodies in relation to the violence against women, particularily the killing of women in Mexico. For this lecture, Dr. Machado focused on the maquiladora murders in Cuidad Juarez. She demonstrated how Christian misinterpretations of man’s relationship to nature, and thus to women’s bodies has led to hatred and violence done to both nature and women as something natural. Machado invoked the theories of feminist theologian Rosemary Ruether, who links Liberation Theology with Nature Theology to show how women are indentified with nature/animals, and therefore despised and justifiably dominated. Dr. Machado discussed the move of Christian eco-feminists, like Ruether, to heal the earth and the body, and to rethink the interpretations of nature and women in the Christian Bible. In this vein, Dr. Machado discussed the environmental abuse in Juarez that exists alongside the abuse of the “maquilocas” or young women who work in the maquiladoras. This led to a discussion about global capitalism, and how in this system, illustrated so clearly in the maquiladoras of Juarez, women and the environment are seen as disposable. The lack of enforcement of environmental regulations, the lack of concern for safety of the young women who work in maquiladoras, and finally the lack of prosecution of the rapists and killers of these young women–the victims of feminicide(the purposeful killing of women because they are women)–implicate the State, both Mexico and the United States. In other words, this problem is both local and global; both particular and systemic. Dr. Machado responded to a question about the link between the feminicides (the purposeful, often ritualistic killing of young women maquiladora workers) and other kinds of domestic violence against women in Juarez and Mexico. She responded that “private violence not prosecuted leads to public violence.” She recommends the film Senorita Extraviada (2001) as a way to understand this. Thanks for the report, Jenny!